It's graduation time, and that leads me to constant reveries about...hair. 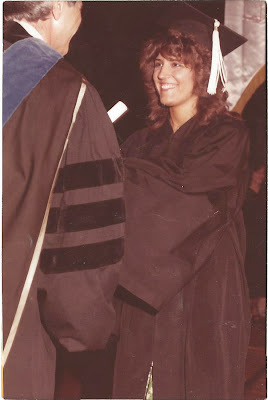 I mean here I am getting ready for my high school graduation, and I can't contain all that hair under my hat. See that big curl sticking up on the right? By the end of the night, there was another one on the other side, and I looked like a wannabe devil as I crossed the stage. 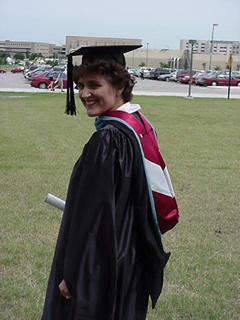 When I finally got my master's degree seventeen years later, I had chopped off most of my hair, but what was there still did its best to dislodge that mortarboard off the top of my head. But enough about hair. We all know what graduation is really about. Here are two that I folded for some of my favorite girls--Melanie, who recently graduated from college and Hannah, who graduated from high school. and the vintage deliciousness of this design. One of my new favorite things to do is to add a library pocket and card to the inside cover of a book, like this one I did for Hannah's book. The library card is a perfect place to stuff a sweet sentiment...and a little sumpin-sumpin, if you're so inclined. The book pages hide the pocket, so you can't see it when the book is displayed on a shelf. See? Hidden away. Unlike my hair. I had a chance to visit with Mrs. Burns-Maycomber not too long ago. She was making arrangements to live in the assisted living wing of the fellowship home. She knew my last name, but could not remember which Boyer, however she did know that it was either Dennis, Alan, or Don. A remarkable woman!